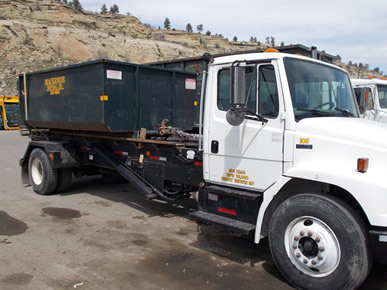 Mackenzie Disposal offers a variety of roll-off style containers for jobs requiring a larger capacity to meet construction needs or for temporary jobs that exceed the capacity of a permanent container. The smallest 15 yard container is very handy in tight construction areas and popular among remodelers. We also offer a heavy duty short sided 20 yard roll-off container that is available for concrete and dense, heavy material disposal. If unsure of what container size would best suit your needs, please call one of our professional staff members at 406-259-3600 and we will be happy to assist.